Complete DJ roadshow lighting rig including 2 American DJ Pocket Pro moving heads, 2 Focus Spot Pro TWO moving heads, a set of par cans and par bars, all controlled by the Pioneer RB-DMX1 DMX Interface for next level light shows. Complete DJ roadshow lighting rig including 2 American DJ Pocket Pro moving heads, 2 Focus Spot Pro TWO moving heads, a set of par cans and par bars, all controlled by the Pioneer RB-DMX1 DMX Interface allowing you to sync your lighting rig to your Rekordbox music library. RB-DMX1 uses smart phrase detection capabilities to interpret the track and create a lightshow or you can create and save completely custom patterns to suit the vibe you are going for. This package includes all the necessary DMX cables. 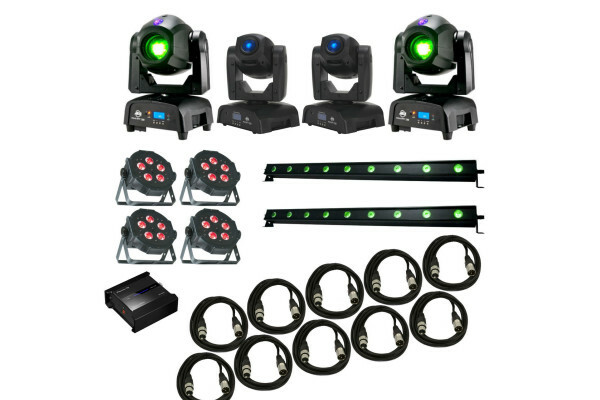 Seen the PRO ROADSHOW LIGHTING PACKAGE 3 from another UK Dealer Cheaper?